What does it take to grow the very best hooves an individual horse can possibly grow? Is it some magical trim, a supplement, or some newfangled shoeing package? The answers are much farther-reaching and involve every aspect of the horse's life. Can laminitis and caudal foot pain be cured? Prevented? Can a carefully cultivated hoof form and internal foot development protect the horse from injury throughout the body? A call for some common-sense balance between the extremes. From cover-to-cover, this book is about growing the healthiest hooves an individual horse can genetically grow. What you do with those healthy hooves is up to you. Genetic factors, pathology, environmental factors, intended work and owner compliance all affect the "right path" to take with an individual horse. We all need to listen. Detailed description and results of the Australian Brumby Studies. Six different environments; six different "natural" feet. These findings demonstrate that much can be learned from the study of wild horses, but many of the sometimes-assumed ideals may need to be re-evaluated. GPS tracking studies, radiology studies, cadaver dissections, effects of different substrates on the feet (36 pictures). Detailed analysis of the growth mechanisms of the hoof. Wall growth from the laminae, bifurcating laminae, sole growth from the bar laminae. Highlights that some serious re-thinking of old ideas needs to be doneÑabout how the equine foot grows, functions, adapts and is held together. A deeper understanding of growth and composition will enhance your ability to make treatment decisions (33 pictures). Detailed descriptions of ulcer diagnosis, prevention and treatment. A "sleeping giant" of the horse world. GI ulcers are far more common than almost anyone realizes. Among other things, they affect movement, and thus hoof form and conformation, and can create dangerous situations for those who work under the horse. Detailed descriptions, tips for clinical diagnosis and/or "becoming suspicious" of ulcers, and a detailed evaluation of treatment medications, including their costs and effects (22 pictures). Gait analysisÑdescription and results, stance phase analysis, swing phase, structural and functional asymmetries, coffin joint kinematics, hoof angle effects on locomotion and left or right handedness in horses. Biomechanical links to under-run heels, hi-lo syndrome and other hoof morphologies (9 pictures). Estimating sole thickness, using the shape and conditions of the sole to precisely locate and to evaluate each internal structure. How to read or "suspect" various types of P3 remodeling in the field. Trimming considerations for optimum sole growth and function. Identifying and removing retained sole. Identifying lamellar wedge, thin soles and problems with sole growth. Special considerations for laminitic patients. Case studies presented and discussed (28 pictures). Discussion of the long list of variables that influence the "correct" heel height on a given horse-on a given day. Heel trimming, evaluation of gait and stance, special considerations for laminitic patients and those with caudal foot pain. Case studies presented and discussed (19 pictures). Treatment of under-run heels. Discussion of different causes: capsule rotation, toe flare, quarter flare, coronary distortion, various loading patterns-and the treatment of each. Treatment of hi-lo syndrome. Effects of left and right handedness to gaits and thus hoof form. Trimming and treatment detailed. Case studies shown and discussed (16 pictures). Club feet and under-run heels. Details injuries, imbalances, genetic factors and habits that can lead to high/low syndrome. Addresses trouble-shooting and treatment, explains laterality (right or left "handedness") and its effects on the development of the whole horse. Discusses therapeutic riding to balance the horse, and thus the hooves. Evaluation of joint elevations, spacing and angles. Effects on saddle fit (19 pictures). Treatment options for angular deformities. The farrier or trimmers role, the veterinarian's role, treatment of adults vs. foals, epoxy extensions (surgical options and splinting are beyond the scope of this book) (10 pictures). Discussion of the specific needs of horses and humans-what do humans need in a horseshoe, and what do horses need in a horseshoe, item by item. Evaluation and discussion of various hoof boots, epoxy systems, casting systems, synthetic shoe packages, and metal shoe packages. What do metal shoes do best? Synthetic shoes? Boots? Epoxies? Fabrics/casting? Details hoof boot modifications and heat fitting, hoof casting, and insole systems for each (but the application of metal shoes, synthetic shoes and epoxy systems are beyond the scope of this book). Special considerations for laminitis, caudal foot pain, protection and treatment of surgery sites, thin soles and wall cracks (14 pictures). 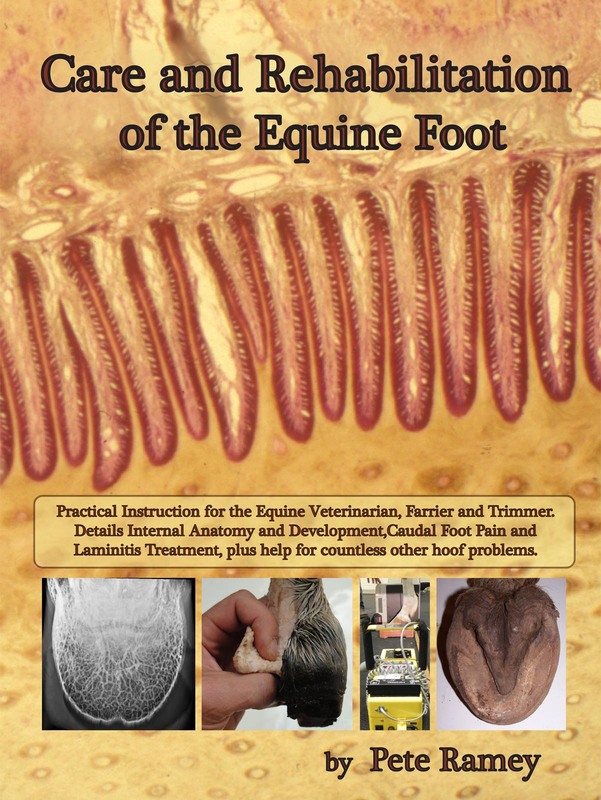 This entire book is directly or indirectly related to laminitis. This chapter attempts to summarize some of the principles and lay out an action plan. Discussion (with dissections) of the causes and significance of "fan-shaped" growth rings, diet, trimming, protective and supportive devices, and general management of laminitis patients. The bottom line is, "an ounce of prevention is worth a pound of cure" (13 pictures). Most of this book is directly or indirectly related to treating and preventing "navicular disease" and caudal foot pain in general. This chapter focuses on the diagnosis and treatment of navicular disease, navicular syndrome, and caudal foot pain. Outlines some of the causes of specific internal injuries and various types of navicular bone pathology. The bottom line is, "an ounce of prevention is worth a pound of cure" (3 pictures). Detailed examination of the donkey's internal and external foot. Specific internal differences between donkey feet and those of the horse are demonstrated and discussed. Special considerations for mules (23 pictures). A call for specific research that needs to be done-specifically, long-term studies comparing various methodologies on healthy and on compromised horses/hooves. Otherwise we will never really know what is the best course of action for a given situation, and the hoof care world will be forever locked in its current state of opinion.